This is the family of flower beetles I just took off the loom. I wanted to study it in gray scale for awhile before I finish the piece. It will be framed under plexiglass with a black frame and a colored flannel backing. The colors of the piece, although similar in value, are saturated and bright. There is of course a bit of sparkle here and there too. At different angles the metallic thread does different things; often highlighting a section not readily apparent from a different angle Black is the only dark value; used largely for outlining the shape. Overall the effect is good; a calming serene feeling - not that creepy feeling that one could get when viewing a collection of dead beetles. The colors almost make one smile. And as in many beetle collection; no one beetle is the focal point yet each can be studied and admired due to its uniqueness. Can't wait to see it finished, framed, and hung in a gallery with lots of light. 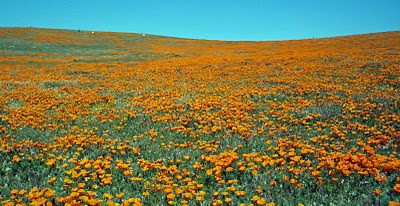 We went for a walk this morning at the Antelope Valley Poppy Reserve. 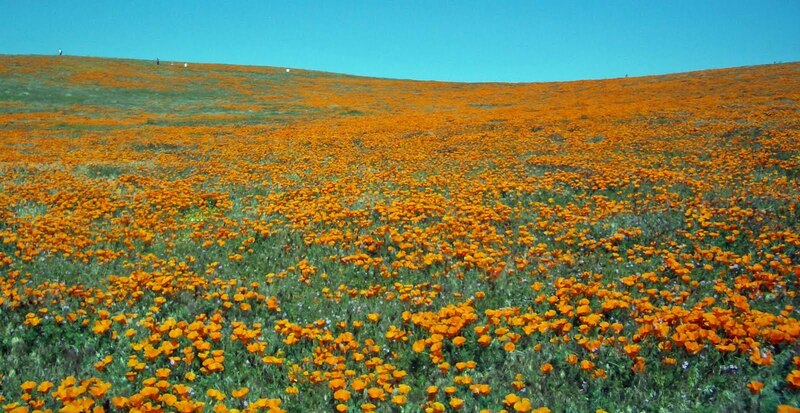 Whew - so much red-orange everywhere! 2. In about nine minutes, at 5pm , the supplemental application period ends for the California Redistricting Committee. Yes, I was one of the initial 30,000+ applicants. The number of applicants who have made it to this next stage is less than 5,000. Still a long shot, but my odds have improved. 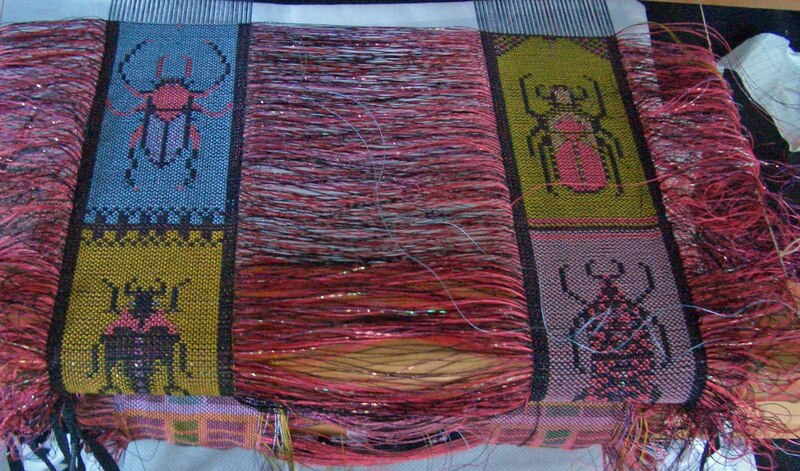 I discovered I had another yard or so of warp left on my sixteen harness ashford so I am weaving a collection of sixteen beetles from the Cetoniinae subfamily; the flower beetles. Four beetles done with a dozen to go. The colors are bright and cheerful and the weaving has been quite pleasant. 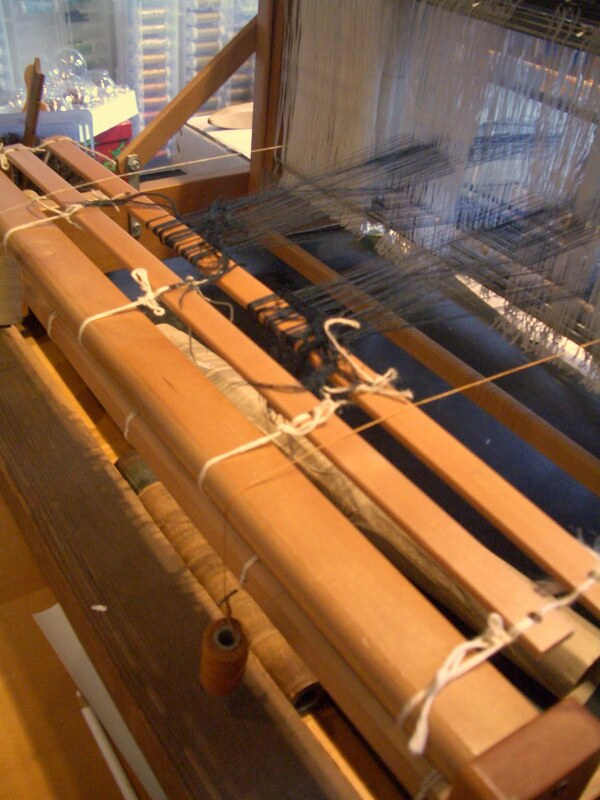 My only problem has been when I forgot my only rule of weaving with fine threads - avoid clothes with buttons. 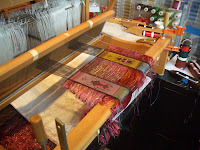 I have two weaving goals this month, substantial progress on the flower beetles & my giraffe tapestry. So far, so good on the first. Today I focus on the latter.